With summer just over a month away, it’s time to post-up notice of “Snakes at the Lake” – 2018, which is scheduled for Saturday, June 30th. As in years past, our current plan has us departing Old Town Sacramento and cruising up Highway 50 through the Sierras as we make our way to the lake. We’ll stop briefly for fuel and a rest break at the Chevron station in Meyers and stage at the golf course parking lot across the way where members from Nevada will meet us. 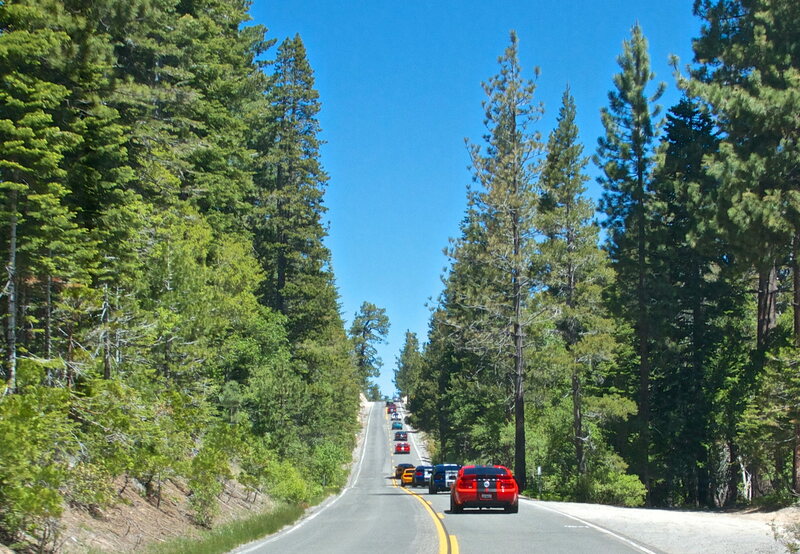 Then we’ll head up scenic Highway 89 on the west side of the lake past Emerald Bay, the Rubicon and Sunnyside areas towards Tahoe Vista on the north shore, where we’re making arrangements again for a relaxing day enjoying a BBQ and Car Show. For a glimpse of previous SATL’s, check out our YouTube videos below. $40 per driver/vehicle, which includes NTPUD facility rental and parking fee, BBQ lunch and cold refreshments. $10 for each additional guest to cover BBQ lunch and cold refreshments. Reservations are requested by no later than Sunday June 24th. Available parking slots are limited this year. This event is rain or shine and payments are non-refundable. So mark your calendars and post-up if you’re interested in joining us for a great day on the road and at the lake with other “Powered by Ford” enthusiasts. Note: For ease of editing, I’ll maintain the list of SATL-9 attendees in Post #2 immediately below. See you on Saturday June 30th in Old Town Sacramento! SNAKES AT THE LAKE - 2018 IS NOW SOLD OUT AND REGISTRATION IS CLOSED. Can’t wait for another great event! Great to have you and April with us again for SATL-9 along with your Super Snake! PS: Can you tell me if Sheldon is +1 or +2? Looking forward to having you and the family joining us for SATL-9. See you on June 30th in Old Town Sacramento! I've got you posted up on the roster above. We'll see you 2 on the 30th in OTS! It's great to have a SATL-1 veteran with us for #9. We'll see you and Carmie (and the SGT?) joining us at the Scott Road onramp to Hwy 50 the morning of 6/30. PS: Maybe we can squeeze in a late afternoon run over to the Hwy 431 scenic overlook above Incline? Sheldon is +2 - April’s sister will be joining us again this year. Ok Jim, Denise and I are signed up. We will be staying on the Delta King boat at Old Town the night before with Harald and Glenda. Valet parking brings car right up to where we meet in the morning. So much cheaper than the Embassy Suites and great breakfast included in the morning. See you then. My wife and I just got signed up! Looking forward to our FIRST Shelby event! Jim - that sounds like a great idea, it's been a lot of years since we last did that photo op. Renee' and I are looking forward to seeing you. Thank you for setting this up. Thanks for the clarification! Roster updated. Great to have you and Denise with us for SATL-9. Thanks for the tip regarding accommodations at the Delta King! See you 2 on June 30th. We're looking forward to having you and Gayle joining us again this year for SATL-9. Your post is a good reminder for everyone to bring folding chairs and either an attachable umbrella or a tent for shade. Thanks! See you in Old Town Sac! We expect to have several classic vehicles in attendance for SATL-9, so you'll be in good company. See you on June 30th in OTS. We're really excited to have you and Cyndi attending your first Team Shelby event, and representing Oregon at SATL-9! See you 2 in Old Town Sacramento on June 30th. Dan I are really excited we get to go this year. Looks like one car, so far. I exercise my womans prerogative to change my mind. Lol. It's really great that you and Dan can join us this year. If you decide to bring the GT and PJ, just let me know. FYI... I'll be meeting several drivers at Sears Sun Valley Concord early on the 30th, so you're welcome to join us. 1 Car + 1 Explorer Sport plus another hungry soul. Your so sweet to invite us, but we will be going up to Sacramento on friday. Can't wait to see you in old town Sat am! Jim - I saw Jill at Bugorama today, she asked which drive I was doing, I had to break the news we are the weekend after the VW cruise.......she was very sad. DEVASTATED is more like it. But yes, very sad. Passing you guys has been a highlight not just for me but for everyone on our trip. You can't talk about our event without the Shelby club coming into the conversation. It just won't be the same. Next year we'll get on the same day again. Hope you all have a fantastic time on your cruise. We'll miss seeing the Dubs too! It's been a huge part of our cruise up the west shore of Tahoe for the past several years. We'll get back on our regular day next year!